World's Oceans Face "Irreparable Damage"
Oceans are on the brink of collapse. That’s according to an 18-month-old investigation of our oceans published by the Pew Charitable Trusts Global Ocean Commission. That’s a big deal, considering almost half of the oxygen we breathe comes from the ocean and one-quarter of the carbon dioxide we produce is absorbed by it. But this body comprised of senior political figures, business leaders, and developmental specialists says that there are ways to prevent things from going south. With us to discuss the report is Rashid Sumaila. He is a professor at the University of British Columbia and was the lead author on another report commissioned by the Global Ocean Commission, titled “The High Seas and Us”. Thanks for joining us, Rashid. SUMAILA: Yeah, thank you very much for having me. DESVARIEUX: So, Rashid, when we say the oceans are on the brink of collapse, what specific scientific evidence can we point to? SUMAILA: There are a number of things happening to the ocean, and one of them is the fish in the ocean. And there has been and continues to be quite a lot of overfishing. And more and more we see that the catch we are getting from the ocean is stabilizing more even declining overall globally. But for some specific fisheries, there have been collapses in it, and the classical one is the cod stocks off Newfoundland in Eastern Canada. So there are some collapses and overall resistible stabilizing of global catches because there’s no more place to go fishing in. We started fishing by the coasts, rather close to the coasts. And as those were depleted, we kept moving further into the ocean and deeper. And now there’s no place to go. What this means is that the fishing effort, that is, the amount of people and machines we take out to catch fish, is increasing whiles we are getting less and less back in terms of returns. So that is on the fish side. And then, when you move into the marine pollution, there’s a lot of debris, plastic being absorbed or taken in by the ocean. And this has huge consequences, right? Some of these things stay in the water forever almost, and they split and become very little pieces of plastic that the fish see and think is food, is algae, and then they eat them, and there are consequences all over. So we have the pollution side. And then you have the ocean acidification, which is becoming a big issue. The oceans are warming with climate change and they’re becoming more acidic. And all these three things together with other things happening, like oil spills and so on and so forth through the ocean, when they come together we’re seeing really serious, serious consequences for our oceans. DESVARIEUX: So, Rashid, you mentioned fishing and overfishing, really. And from my understanding, the fish catch rate across the world has really been declining since the late ’80s. What kind of decline have we seen since then, and what are the main causes, really? SUMAILA: You know, people are talking about–we are seeing declines of up to 90 percent in some species. In fact, I’m currently in Chile now, and we’re here for a workshop, because the country is seeing their fish stocks declining seriously and people are having problems. A few decades ago, the /hæg/ fisheries here, they were catching up to 1 million tons of fish just a couple of decades ago, and today they cannot get 100,000 tons. So that is the kind of declines we’re seeing in parts of the world. It’s just crazy. 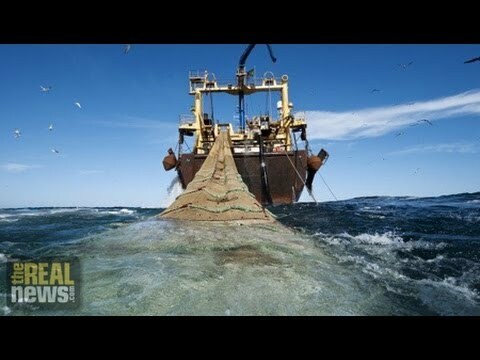 In Namibia at the peak they were catching up to 2 million tons of sardines, and now they cannot even get 50,000 tons. So we are talking about serious changes here. People go out to fish. They used to go out, in a couple of hours they fill their boats in coastal places around the world, and now they go the whole day, the whole two days, and they don’t catch half of what they used to catch. So the evidence is all over the place, however you look at it. We are really taking down the fish stocks around the world. DESVARIEUX: And these serious changes have serious consequences, because the ocean is considered the world’s biggest ecosystem, covering over two-thirds of the planet. What does it mean if the ocean collapses? What kind of effect would we see worldwide? And who would be mostly affected? SUMAILA: Oh my gosh. This is what keeps me nervous, awake in the night, you know? Now, if you look at–currently we are taking about 18 million tons of fish a year out of the ocean globally, 18 million tons. To give you an idea what this means in terms of food security for people, that is the equivalent of taking of 18 million mature cows that the ocean gives us each year, we take out from the ocean. Huge. I mean, the food security consequences are just remarkable. Especially in poor, developing parts of the world, you see that this is the main animal protein they have. And even in the rich parts of the world–like I like to say, in Vancouver, B.C., where I live, I mean, one of the famous restaurants is the sea restaurant, which serves all the seafood and sustainable seafood. When people are in a good mood and they have something to celebrate, that is where they go to. So this is food which is really valued by the rich, and also very important for the poor people of the world. And so we really shouldn’t let this go, because it will be huge consequences. Now, when you talk about employment, the fisheries, ocean fisheries, employ roughly about 260 million people around the world if you take the fishing and all the processing that takes place. And, again, most of these people are actually in the large developing countries of the world. And think of the social consequences of this. These are people who would have nothing else to do if it weren’t for fishing. And so it serves a huge social service for the world by keeping people busy. As we know, an idle mind can do all sorts of crazy stuff. So the fish are useful in so many ways. DESVARIEUX: Rashid, let’s talk and turn about what can actually be done, because the Global Ocean Commission called for a five-year rescue package. Can you just outline what were the key points of that rescue plan? SUMAILA: Yeah. The first one they asked for is to have a UN-level Global Ocean Commission or some office that looks at the global ocean and also regional ones to help us monitor and see what is going on. So that is a very important one. In fact, added to this, connected to this is the call for a sustainable development goal for the ocean, specifically for the ocean. This is something that is being discussed now and to be developed for the world as a whole. But this commission has thought that the ocean is so crucial, we need a separate one for the oceans. So that is one very important thing, and this has to go through the United Nations, and countries have to agree on this and form these important bodies to help monitor what is going on. Now, then there is a call to take out fewer subsidies. Subsidies are payments that our governments around the world give to the fishing sector for various reasons. But then they have huge consequences when it comes to sustainability, because essentially if you’re paying the fishing company or fishing unit[, they’re fewer? ], you make it more seem to be profitable to go fishing because somebody is covering part of their cost. And that leads to more fishing and overfishing and the depletion of stocks. So, many of us in this business, through analysis and evidence, have come to the conclusion that taking away–fewer subsidies will really be one of the ways to help sustain the oceans. And you don’t need to take away the money from the communities. You can you keep the monies in the communities, but let them help the world rather than destroy our ocean. Use it to train people, use it to help people move into more sustainable livelihoods. And that will be a good thing. So that was one big one. DESVARIEUX: Rashid, these all sound like reasonable proposal. But what would need to happen for this to take place? Because, I mean, technically they are supposed to be protecting the oceans. We have systems like the UN Convention on the Law of the Sea, which aims to regulate portions of the ocean. But they can’t actually enforce any laws. What needs to happen to get proposals that you just put forward off the ground? SUMAILA: I think most of us, I mean, when we look at the problem, we really believe that getting the information to the population, to the people on the ground, will help in a big way, because what we are facing here is that of special interests; you know, people have their interests and they benefit from the current status quo, and therefore block any efforts to try to make progress. And so we just have to involve people. And that is why many of us in the academy do the kind of thing I’m doing now, try to engage with the public, get interviews, get into the media, and get the message out. Many times peoples listen to this kind of interview and they call me and say, you mean, we are really paying people to go and destroy the ocean? I say, that is precisely what we are doing. And so involving the public will be one crucial way. DESVARIEUX: Alright, Rashid, thank you so much for joining us. I certainly learned a lot. And I hope you can join us in the future. SUMAILA: You are most welcome. Thank you for having me. DESVARIEUX: And thank you for watching The Real News Network.